When it comes to speaking with employers about the Americans with Disabilities Act (ADA), most will speak about the benefits of hiring people with disabilities. I won’t stress this issue much because it’s been drilled and spoken about so much, that any employer should, by now, either be targeting their recruitment efforts to hire more people with disabilities or at the very least understand that hiring people with disabilities is one of the smartest business decisions they can make. If any employer needs more information on that, they can check out other BlogForce blogs or simply do a little research. So, other than speaking on that issue, I’m going to address how to make your business more accessible for people with disabilities. Instead of asking you read a 100 page document by the US Access Board outlining different measurement and accommodation requirements, I’ll simply give you a few quick suggestions for making sure your business site is as accessible as possible to potential customers or employers. Let’s talk about making your site accessible and removing possible obstacles from the entrance of your business. Do you have accessible parking spaces outside your office? That’s where you want to start to make sure that your business is welcoming to people with disabilities. Try to put at least 2 accessible parking spaces as close as possible to your front door. Someone using a wheelchair, walkers or crutches would find it easily accessible and would more likely visit your location to do business. Automatic doors were designed to be more accommodating to those with disabilities, but they are an addition that can make almost any business more attractive and could possibly be written off on your taxes if you have employees with a disability. Let’s consider the layout of your business. Do you have an open floor plan allowing for easy movement without obstruction? If not, consider shifting things around or removing extra chairs/furniture so that there is at least 32” of space. This gives people using walkers or wheelchairs enough space to navigate the area. Other quick solutions can be as easy as lowering your counter tops so customers using wheelchairs can access the reception area and can be seen by a receptionist. If you have televisions in your waiting area, turn on the closed captioning, which is a useful tool when working in a noisy area. It’s also nice for those with hearing impairment to sit comfortably and be entertained while waiting. Also, having public-facing staff members learn some simple sign language could be immensely helpful. For instance, greeters and receptionist could learn words like hello, sign here or how can I help you. These are quick, useful tips that you can use, and they are fairly inexpensive changes. The changes that may cost a little more may be written off on taxes under various circumstances. Please review other Blogs if you need additional information on ADA. Thanks for reading! Cornelius Booker is a senior member of the Regional Navigator team and a graduate of Oklahoma State University where he received his Bachelors in Marketing and later received his M.B.A with a focus on Business Marketing and Management. 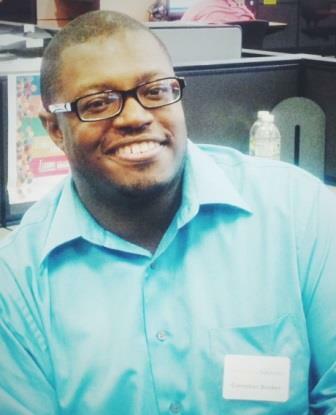 With his personal experience and passion for the disabled community, Cornelius’ insights are an invaluable asset to the Workforce Solutionsorganization.